. It’s a new kind of home Wi-Fi solution that gives you strong, reliable coverage, in every room. Traditional Wi-Fi routers aren’t always built to support the increasing number of devices we use or the high bandwidth activities like gaming or watching videos. Google Wifi is different. It’s a connected system that replaces your current router and works with your modem and internet provider. It brings everything you love about Google -- smarts, security and simplicity -- to home Wi-Fi. Google Wifi uses a technology called mesh Wi-Fi. Within our mesh network, each Google Wifi point creates a high-powered connection, and the different Wifi points work together to determine the best path for your data. The result is Wi-Fi coverage in every corner of your house, not just right next to the router. None of us want to spend lots of time tweaking complex settings or managing our Wi-Fi network. Google Wifi is smart, and automatically places your devices on the clearest channel and optimal Wi-Fi band, so your family, friends or flatmates can keep doing what they love without missing a beat. And as you move around your house, our built-in Network Assist software will seamlessly transition your device between the Google Wifi points in real time, to help you avoid dead spots and delays. Google Wifi is an expandable system, so if you have a larger home, you can simply add more Google Wifi points. They connect to one another to spread a strong consistent network signal to every room. 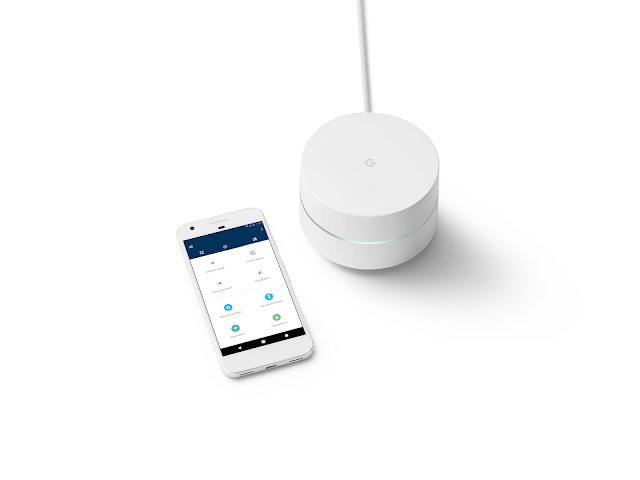 To make sure you’re always in control, Google Wifi is managed by the Google Wifi app, available on Android and iOS. The app helps keep your network safe and secure, and let’s you do things like pause Wi-Fi on kids’ devices, or create recurring pauses for dinner or homework with scheduled pause. It also shows you which devices are connected and how much bandwidth they’re using. You can even prioritise devices within your network so you can stream that latest TV episode without interruptions. And if you ever need help with your Google Wifi system, we’re here for you. Google support agents are available to lend a hand by phone or live chat 24 hours a day, 7 days a week. Google Wifi will be available in New Zealand starting Thursday, July 20 as a 1-pack for $229 and a 3-pack for $599 from Noel Leeming, Harvey Norman and JB Hi-Fi. You can find out more about Google Wifi here. From binge-watching your favourite TV shows, to searching for cookie dough recipes, to playing your favourite video game, having strong and reliable Wi-Fi at home is the key to staying connected. Starting today, Kiwis can get their hands on Google Wifi. It’s a new kind of home Wi-Fi solution that gives you strong, reliable coverage, in every room.